Magic the Gathering MTG Magic 2010 core set Booster pack contains 15 cards each. Released in 2009, Magic 2010 (M10) is the first core set to contain approximately fifty percent new cards. The set contains 249 black-bordered cards (15 mythic rare, 53 rare, 60 uncommon, 101 common, 20 basic lands). At least five plainswalkers will be included in the mythic rares. Magic 2010 is a Magic the Gathering expansion set, that was released on July 17, 2009. It is the eleventh core set for Magic: the Gathering. It is the first Core Set since Beta (which included two cards accidentally left out of the original Alpha) to feature new cards; about half the cards were new with the rest being reprints (in contrast to most previous core sets, which consisted entirely of reprints). Magic 2010 (or M10 for short) marked a major shift in the way WOTC produces and markets the "Core" set of their marquee trading card game, Magic: the Gathering. M10 was the first core set since Revised (the third edition) to not be labeled with an ordinal number. Another important marketing change was that starting with Magic 2010, Wizards of the Coast releases a new core set every year, instead of every two years, as they did since 1995. Most significantly, Magic 2010 was the first core set since the very first editions of the game (Alpha & Beta, both released in 1993) to contain new cards; every other core set has contained only reprints from previous sets. Previous policy regarding which cards to reprint in the core sets led to the Core set product drifting away from its intended function. Wizards decided to introduce new cards into M10 so that the Core set could serve as a better introduction to the game for new players. There were 112 new cards printed in M10, the remainder being reprints. 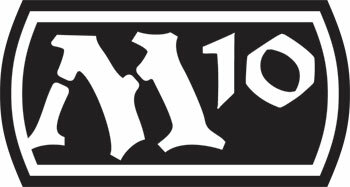 M10 was the first core set to include "mythic rares" as well as the first core set to include planeswalkers, a relatively new card type which was first introduced in 2007. All five of the initial set of planeswalkers from Lorwyn were reprinted in M10 as mythic rares. Wizards of the Coast has also overhauled the core rules of the game with the introduction of Magic 2010. The changes included the renaming of several zones and actions of the game, eliminate the 'mana burn' rule of the game and, and more relevant for gameplay, an alteration to the way combat damage is assigned. This was the first major alteration of the game rules since the introduction of 6th Edition rules in 1999, and was instituted to make the game more streamlined and intuitive; previous damage-assignment rules, for instance, would allow a creature to, in the words of Magic Rules Manager Mark Gottlieb, "swing its fist to punch, vanish from the battlefield, and [still] have that punch land." The rule changes, particularly the changes to the procedures of combat damage, have been controversial. Even a petition website was created to convince Wizards of the Coast to revoke their changes to the combat rules, but fewer than 1,000 people had signed the petition one year after the petition went online.